DramaFever, an online video streaming site that provided subtitled dramas from Asian countries such as Korea, Japan, and China for free or discounted prices, shut down on October 17. The site was behind the production of popular dramas such as The Heirs (2013) and Tomorrow’s Cantabile (2014), and was one of the main platforms to give many K-dramas a global broadcast. The site, which was founded by Korean Americans Suk Park and Seung Bak in 2009, originally began as an online video streaming service. It was then acquired by Japan’s SoftBank Group for USD 100 million in 2014, and re-acquired by Warner Bros. in 2015. Park, who continued to head the site since then, said the sudden decision to shut down stemmed from “a variety of business decisions,” including the spike in content acquisition fees and streaming service costs after the acquisition of AT&T by Time Warner. 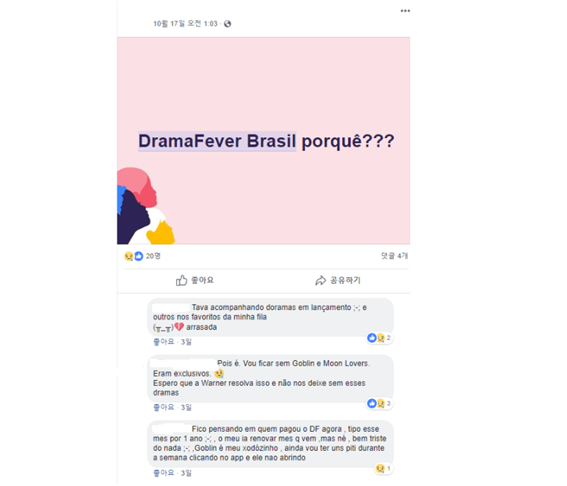 The news came as a disappointment for both the K-drama industry, which had started racking up more fans in Brazil, and the local fans themselves. Although there are other free video streaming sites such as Viki, Netflix, AsianCrush, Hulu, and Dramago, amongst them, DramaFever had accumulated the highest number of users, according to Snaptube. “I used DramaFever for a long time because it offered dramas not provided on other platforms. I’m disappointed that I will not be able to finish watching the dramas I hadn’t completed, and I hope these dramas will soon be offered on other platforms,” said Juliana, a user who had watched K-dramas on DramaFever as an annual subscriber. At the news of the shutdown, many other users seemed more disappointed that they could not use the service anymore, rather than worrying about receiving refunds for the subscription fees they had already paid. In Brazil, most Korean dramas are watched on the platforms mentioned above. Portuguese subtitles for such dramas are difficult to find in comparison to English or Spanish subtitles, so platforms such as DramaFever are often the only way for viewers to watch their favorite shows. Recently, local cable channels decided to capitalize on the growing popularity of K-dramas, purchasing the rights to several shows, providing Portuguese dubs and broadcasting them publicly. Brazilian public broadcast station Rede Brasil, for example, broadcast shows such as Happy Ending, Her Legend, and Athena: Goddess of War, which started its broadcast this November. Iris was broadcast on some pay-to-watch subscription channels as well. Many are disappointed that the platform that played a major role in introducing Brazilians to Kdramas is gone. However, these fans are still watching K-dramas on other video platforms and are actively partaking in the K-drama market. The competition to keep these fans enthralled continues, and the K-drama boom does not look like it will die down anytime soon.